Set includes 3 cleaning supplies; broom, brush and a dustpan. Perfectly designed for realistic functionality, broom and brush have actual bristles just like the real ones. 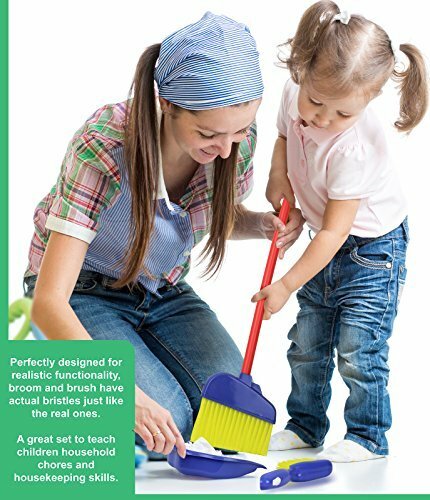 A great set to teach children household chores and housekeeping skills. With the Click n' Play Cleaning Play set, your children can sweep, and dust with their very own kids cleaning set, just like mom and dad! Sturdy Construction: This kid cleaning set is constructed of tough and sturdy, heavy-duty, high quality plastic. This means that you need not worry about pieces from your cleaning toys for kids breaking or becoming hazardous to your children. Included are 3 cleaning supplies a broom, dustpan, brush for kids to enjoy. This set will last safely for years of fun and enjoyment. Made of high quality kids safe BPA free material, meets all USA standard requirements. The broom, brush and duster have actual bristles for realistic functionality, meaning while your child plays with these cleaning toys for kids, he or she can actually have fun helping out while you take care of your household duties, great toy for learning at home. The Click n' Play Cleaning Play set is great for any child aged 3 and up, and will provide hours of play housecleaning fun!.